For over 70 years, Nor-Lake has offered the very best in quality, food safety and customer service. 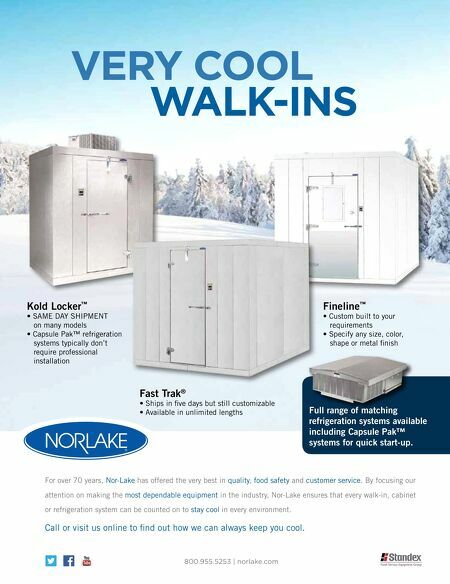 By focusing our attention on making the most dependable equipment in the industry, Nor-Lake ensures that every walk-in, cabinet or refrigeration system can be counted on to stay cool in every environment. Call or visit us online to find out how we can always keep you cool. 800.955.5253 | norlake.com Fineline ™ • Custom built to your requirements • Specify any size, color, shape or metal finish Kold Locker ™ • SAME DAY SHIPMENT on many models • Capsule Pak™ refrigeration systems typically don't require professional installation Fast Trak ® • Ships in five days but still customizable • Available in unlimited lengths VERY COOL WALK-INS Full range of matching refrigeration systems available including Capsule Pak™ systems for quick start-up.